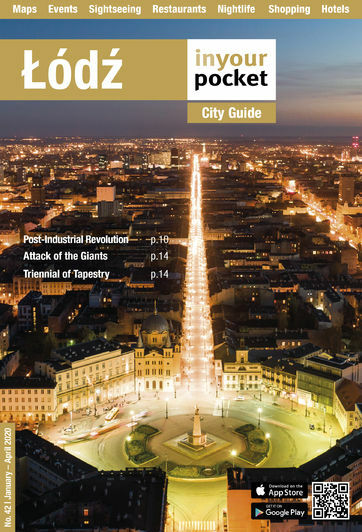 In spite of being Poland's third largest city Łódź's links to the outside world once left much to be desired, though the birth of the budget flight opened a few new routes. Travelling to other destinations in Poland, barring Warsaw that is, can be a trial. Fortunately once you're here you'll find the city has a well-developed tram and bus network as well as a bountiful supply of cheap taxis. If you're traversing Piotrkowska, the principal high street, then take advantage of one of the dirt-cheap rickshaws that zip up-and-down the street. As Poland's third largest city Łódź gets its fair share of air passengers, and with a brand new terminal the experience of flying in to and out of the city has gotten increasingly more pleasant (well, as pleasant as flying can be, anyway). With the city lying in the centre of the country, Łódź is a crossroads for many of the rail networks covering the country. To handle the traffic Łódź has three stations - Kaliska (generally for east/west routes) and Widzew (north/south routes). The third major station is the new Łódź Fabryczna, which is the biggest and most central of the three. It is also currently a dead end with all trains terminating here, although that will change once the connecting tunnel to Łódź Kaliska is finished in 2022. Read more about the new Fabryczna station in our feature here. With the opening of Fabryczna the main Łódź - Warsaw line has also undergone a major overhaul and high speed connections will now whisk you to the capital in under 90-minutes. You can take trains directly from Łódź to most major Polish cities but the speed on many can be slow and minor delays are standard. At present a 250km journey to Kraków will take anywhere from two and a half to four hours. Gdańsk, 370km away, will take around 5 and a half hours. It is worth checking the useful website www.rozklad-pkp.pl for the best connection. Most Bus travellers to Łódź are dropped off at the Łódź Fabryczna Bus station although some may still be routed to Łódź Kaliska Station which is a 15-20 minute trip from the centre. In the last decade, the road quality issues in Poland have been addressed with EU directives and funding, however, the work is definitely ongoing. The issue of the condition of the road and rail networks were cited by many experts as being a serious handicap to the development of the Polish economy but then EURO 2012 and EU funding thankfully lead to steady but noticeable infrastructure changes. For someone taking to the road today the following warnings should be taken into account. Generally, you will most likely stick to high-speed and good quality motorways or expressways, but do remember, once you leave these roads onto old single lane roads, you will be driving amongst anything from a sports car to a tractor. This results in frustrated/impatient drivers overtaking each other at high speed and then braking sharply to avoid oncoming traffic. Be warned and keep a safe distance between you and the vehicle in front. Indeed, despite the overall road improvements, Poland is still one of Europe’s leading nations in road fatalities, statistics that will surprise few who have had the pleasure of using the roads here. Also, beware of the hard shoulders of these roads, the vast majority of which are unlit at night. These are often used as pavements by local people who add to the Russian roulette by venturing out at night wearing their darkest clothing. Add in the odd drunk on a bike and these hard shoulders become a very real problem when facing a set of headlights bearing down on your vehicle. For those brave enough to venture out on the road, the following information should be noted. Poland has strong drink-driving laws: 0.2‰ is the maximum blood/alcohol limit, so forget about having even a single beer. EU citizens may use their home driving licenses as long as they are valid, however citizens of countries that didn't ratify the Vienna Convention (tsk, tsk Australia and America) will find their licenses invalid (though that hasn't stopped anyone we know from driving their girlfriend's car). Carry your license and passport at all times when driving. The speed limit is 50km/hr in cities (60km/hr between 23:00 and 05:00), 90km/hr outside urban areas, 120km/hr on dual carriageways and 140km/hr on motorways. All cars are required to carry a red warning triangle, first aid kit, replacement bulbs and a national identity sticker. A new law was introduced in April 2007 making it compulsory to have headlights switched on at all times. Car related crime is high and drivers should make use of guarded car parks where possible. Connecting Łódź with the outside world are the E75 running north, the E30 going north east, the west bound A2, the south running E75, and road number 72 heading to the east. Once in Łódź the first thing you’ll notice is the treacherous state of many of the roads, and you’d be advised to make sure the shock absorbers are in full working order. Car crime in Poland is rife, and we fully suggest taking advantage of one of the two guarded car parks in the city. If you’re parking on the street you’ll be paying one of two rates from 8:00 - 18:00 (Mon - Fri): Zone A: 1,50zł (first 30mins), 3zł (first hr), 3,50zł (second hr) 4zł (third hr) 3zł (fourth and every additional hr). Zone B: 1zł (first 30 mins), 2.50zł (first hr), 3zł (second h), 3,50zł (third h) 2,50zł (fourth and each additional hr).